(CNS) Updated: The Cayman Islands Fire Service was busy tackling a major fire at the George Town landfill Friday. Areas of George Town were filled with billowing black smoke as the blaze, which started in the area where baled metals are stored and then spread to the tyre storage area, raged. 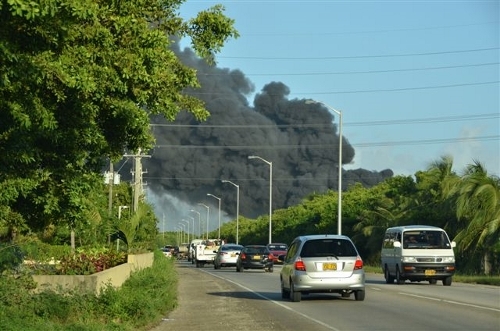 Despite the thick acrid smoke, government officials said in a statement that it did not pose a health threat to the wider community because it was at a high enough level and the prevailing winds were carrying the smoke away. Firefighters had the blaze under control by lunch time, having begun battling it in the early morning hours. Fire officials had described the blaze as "a big one" earlier today. The Department of Environmental Health noted that the blaze had not spread to other parts of the landfill. 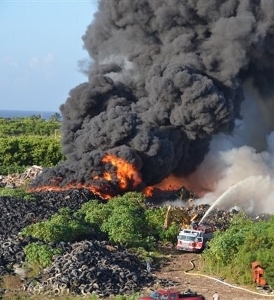 The Ministry of Health, Sports, Youth and Culture and the Department of Environmental Health confirmed this morning in a statement that the fire appeared to start between 3:30am – 4:00am in the north-western corner of the landfill before it spread to the tyres. "The Fire Services Unit was promptly notified and DEH staff and Fire crews responded immediately," government stated. 'They quickly created a fire break between the tires that had ignited and those that had not yet been reached by the fire." The fire did not spread to the main waste disposal areas, they stated, and was contained in the bulk waste areas. "The smoke from the fire has risen and remained at high enough levels to minimize impacts on residents and the harbour, and is being carried off-shore by the prevailing winds," the ministry said. "As a result of the efforts of Fire Services and DEH staff, the fire is currently under control and it is expected that it will be fully extinguished within the next four to five hours," officials said at 12:30pm. The DEH said it was investigating the cause of the fire and apologized to the public for the inconvenience caused by the fire, adding that the ministry would provide further updates later today. Surely as the sun will rise, this fire was an act of Arson. Why would anyone capitalise "arson"? Obviously…the dump and the prisons need to be placed in Cayman Brac. At least GC would get someone benefit from the welfare mini-state then. Recycle Recycle Recycle Get the message Mr Bodden??? No difference here with time wasting like getting the NCL passed after some 20 odd years.Mr Bodden its time to get this done BEFORE its too late I guess votes are more important?How many more times to tender before we get serious? ossie we will spend the next 18 months getting proposals, tenders, reports…etc……only to find out that the dart option was the only affordable practical solution…..but by then it will be election time and he will have done his job for the backward thinkers of bodden town and will be duly re-elected……….the vicious cyle of caymanian politics continues…. Has anyone thanked the firemen? It was a large scale fire and they should be thanked for their service. They put their lives on the line and all some people are concerned with is what the tourists experience was like. Fires break out and people seem at times to think it is impossible that a fire could ever take place in Cayman. Does the dump need to be dealt with? Yes. Does the landfill need to be moved? Yes and no. I say this because of the way the last report was handled by the previous administration and the decision to move the landfill to Bodden Town was posed as the only solution, when there were many other options to consider. When the proper meetings are setup and all options are considered then we can move forward. Not meetings that are mere formalities to push a decision made well before public consultation is even considered. I know the fire caused many inconveniences but that picture is pretty awesome. We need to Recycle! At least the dump has made some space! Nature at work! Sorry for the cruise ships but glad it blew over the ocean! it is a shame that nobody on island really care about this ecological threat for the island. What is "on island" and where is this constantly creeping in from? The proper way to say this is surely , 'on the island'. Who your daddy is?? ?……………………….y'allright now? This is why is needs to move from the most economically important part of the island. Yea I agree, we need to move the dump far to the east so when the smoke billows again the rest of the island can get some. No not really, just a sarcastic poke people! I shudder to think that the smoke was just the half of the problem, the rest is the cocktail of nasty compounds that leach into the ground after a tire fire. How about building an 'earth ship' bunker to protect heavy equipment. Make some good use out of those tires instead of just stockpiling them. Thetire pile is just begging for someone to set it alight thinking they are doing what they think is a traditional good deed. Oh and to the wannabe expert who suggested plasma gasification. This technology is far from being an economically feasible solution to Cayman's relatively small annual solid waste generation and high electricity cost. I say go for it, if you get everyone's agreement and collect CI$ 250/ton waste tipping fee, but then there is simply not enough waste generation yet to make such a plant feasible here. The best solution for Cayman right now is to scrap all other major capital projects such as Air and Cruise Ship Ports and construct a screening/sorting/incineration facility which can be retrofitted for cogeneration in the future. Currently the energy fraction of Cayman's waste generation is not enough to warrant buying into a full blown waste to energy plant. Facilities of this type are not cost effective if there is not enough waste to keep the burn going 24/7/365. Plasma gasification is the solution, check it out. 1. The cost. It would be cheaper to ship the trash off island for processing. 2. We are talking about a facility that can't even keep basic mechanical equipment in working order – do you seriously reckon they could manage a complex PG plant? All that has been said about the huge dump fire in Grand Cayman can be said about the dreadful dump fires that occur in Mini-Mt. Trashmore on Cayman Brac! The dump has been the subject of UNTRIED solutions for the past 30 years – moving it somewhere else (up on the Bluff that is now inhabited by hundreds of Caymanians and Ex-pats) or east of the Ashton Reid Drive (crossover island road) or anywhere but where it's been for over 3 decades. Whenever Government has mentoned a new site for the very old dump (an extremely rare occurence)nothing – zilch, zip, zero – happens on that private property South Side. next to Crown Property (Bluff-face). Meawhile smouldering underground dump fires spewing chemical carcinogens and unbreathable air continue to pollute the tradewind breezes of pricey hotels, condos,restaurant and houses on the white sandy beach reef-protected Southwest end of the Brac. Wow, what a waste of energy! You witnessed the power of trash! Can you imagine a very clean and green "trash to energy plant" built at the dump site. toxic emissions. The mountain of trash would eventually be gone, and hundreds of homes ccould be supplied with power. Win Win for all. These plants exist in upscale neighborhoods in Skandinavia. GOOGLE IT………..FIX IT! I don't think that the powers-that-be who getting their profits elsewhere will allow this to happen in Cayman. It will be an uphill battle. an assessment must be made of this property and its contents and measures taken to prevent these potential catastrophies. We need not put our brave civil servants in harms way for the sake of burning rubbish. Listen……what was experienced today pales in comparison to the day or night that a spark ignites the methane gas that's trapped in that landfill. Anything within a 5 mile radius will be effected and the closer to the landfill one is, the more serious the consequences. Government, and I don't necessarily mean this one, but as a whole needs to find a solution to this serious problem and deal with it. It's just a matter of time and the clock ticks faster as each day passes by. And in closing, why was the Fire Service not on the backside of the fire I.e. on Esterley Tibbetts road to ensure that no embers jumped and spread fires to the numerous buildings in the area. Safety was seriously lacking in this area today…. hmmm, did the fire jump? No. Maybe they knew what they were doing? to get rid of the tyres in a timely fashion and provide the island wih some economical electricity. The 6:00 pm news on Radio Cayman ignore the dump fire in tonight's broadcast. It must be nice, is ytou have a problem, simply deny it and it doesn't exist. Remember the five alarm tree fire behind the old Marriott Courtyard Hotel before it was torn down? Despicable, despicable times these are. The only fire to burn for days AGAINST the wind. Yep. Weird how the dump fires always start at 3am too. Really, now an unnamed developer started the fire stop trying to start rumors..
What a disgrace this has been and the worse is yet to come. What if the dump explodes one day? We need to realise how serious this is and our elected representatives MUST take action now. Ozzie, this falls under your portfolio, please get a grip on this now! Why this was not addressed first before ANYTHING else is beyond me! If the dump were to explode from all the methane gases and various toxins we would have a MASSIVE problem in the capital of our country. Just think ahead, for once please. Well I woke to go get me a cold pop and then I thought somebody was barbequing. And I said, “OhLord Jesus it's a fire-r!" Then I ran out, I didn't grab no shoes or nuthin, Jesus, I ran for my life. A number of offices closed office today as the carcinogenic fumes were getting in through the A/C system. I'm sure today's cruise-ship visitors won't have happy memories to share with their friends back home either. How much has been lost in economic terms and future tourist income as a result of the refusal to deal with the political hot-potato that is the dump? Can you imagine the comments the visitors from the cruise ship were saying about Cayman? The photos and videos taken today were negative public relations for sure, what is to be done? If memory serves we had a Carnival and a ‘dam’ in port Friday. They were way too busy trying to stash boxes of Cheerios in their backpacks to avoid paying for lunch on Island to notice their own backsides on fire. What's the comparison? Both are spectacular?